Books can serve many purposes. They can be an escape, a way to experience the world despite limitations, and a way to recognize and release the emotions life situations can stir up. Reading has healing powers and especially teen books because they contain an emotional honesty and freshness of perspective that is often lost when one reaches adulthood. Amy’s Marathon of Books will be a journey across the Canadian landscape of teen fiction, opening readers up to new perspectives and inspiring book lovers to fund a teen book award. Amy Mathers has been passionate about reading from a very young age. Born with a type of glycogen storage disease, Amy received a liver transplant at the age of five and a heart transplant when she was 27. 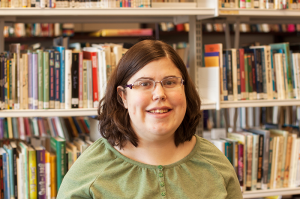 Despite her physical challenges she has volunteered in various libraries, worked as a bibliotherapist, taken part in a high school reading selection committee and co-written and co-taught a college course called “Assisting Families Dealing with Chronic Illness & Disability.” Amy is looking forward to beginning her reading journey across Canada, and hopes others will share her enthusiasm for funding a teen book award. The Canadian Children’s Book Centre (CCBC) is a national, not-for-profit organization, founded in 1976. We are dedicated to encouraging, promoting and supporting the reading, writing, illustrating and publishing of Canadian books for young readers. With book collections and extensive resources in five cities across Canada, the CCBC is a treasure-trove for anyone interested in Canadian books for young readers. Our programs, publications, and resources help teachers, librarians, booksellers and parents select the very best for young readers. You can find out more at www.bookcentre.ca.